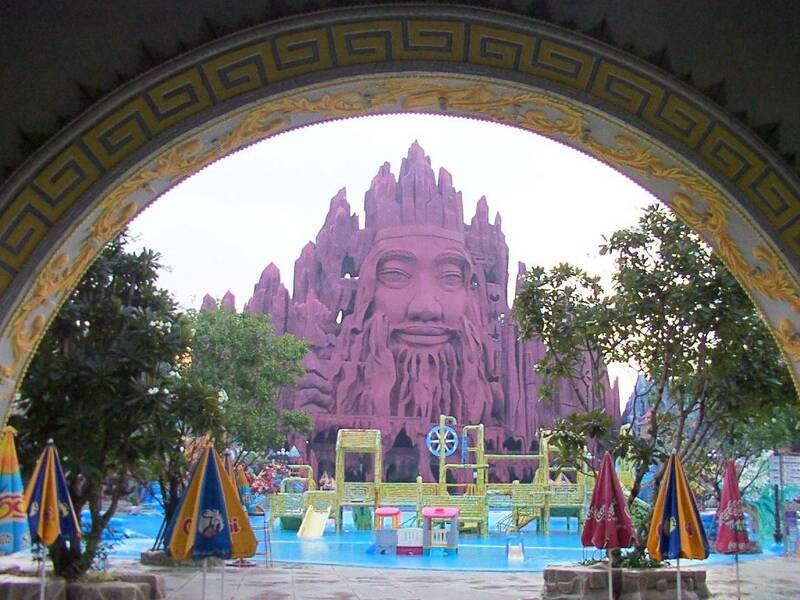 The Buddhist themed amusement park, Suoi Tien, opened in Ho Chi Minh City in 1995. Dr. James Bielo is an Assistant Professor in Anthropology and Founding Board Member of the ISS. 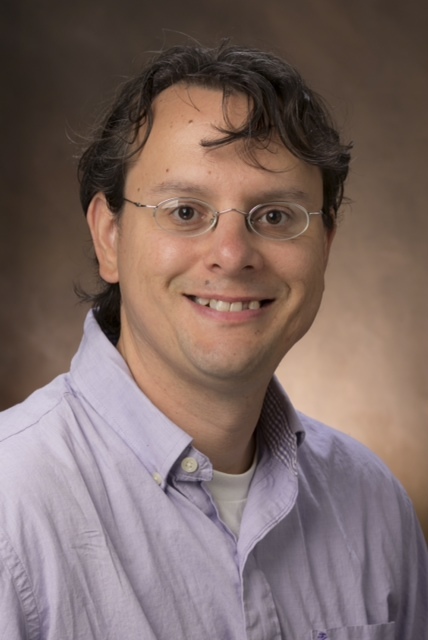 His ethnographic work focuses on the contemporary United States, specializing in Linguistic Anthropology, Ethnographic Methods, Anthropological Theory and the Anthropology of Global Christianity. He is the author of Words upon the Word: An Ethnography of Evangelical Bible Study (NYU Press, 2009), Emerging Evangelicals: Faith, Modernity, and the Desire for Authenticity (NYU Press, 2011), Anthropology of Religion: The Basics (Routledge, 2015), and the editor of The Social Life of Scriptures: Cross-Cultural Perspectives on Biblicism (Rutgers Press, 2009). Dr. Bielo received his Ph.D. from Michigan State University in 2007. Learn more at www.jamesbielo.com. Q. I was wondering if you could speak a little bit about what first drew you to the Ark Encounter? Literalist scriptural congregations exist the world over, but there seems to be something particularly American about this project, its size and scope, its fidelity to entertainment and judgment. This certainly isn’t the first biblical theme park, as you mentioned in your essay “Making a Biblical Theme Park,” but one can’t help but feel the Ark Encounter demonstrates a clarity of purpose that is lacking in Orlando’s The Holy Land experience, for example. In other words, the Ark Encounter, as you make clear, isn’t just about edifying the biblical story. What first peaked your curiosity? A. This is an excellent opening question: what first peaked my curiosity about Ark Encounter and what makes it a distinctive project (both locally in the field of American fundamentalism and globally vis-a-vis other Christian expressions)? I was drawn to the possibility of capturing the making of a biblical theme park, being behind-the-scenes, catching cultural production in process. There is some very good work on sites that materialize the Bible from scholars in anthropology, religious studies, theology, and cultural studies. All of this work focuses on matters of consumption, either the devotional consumption of committed religious actors or the critical consumption of scholars. However, there is no research on the behind-the-scenes labor of cultural production that proceeds (and, of course, structures) acts of consumption. The theoretical conceit here is that by using ethnography to document the production process we gain distinctive and substantial insight into forms of culture-making that typically remain hidden or obscured. With Ark Encounter, we have the chance to understand how a creative team in charge of conceptualizing and designing a park integrates biblical literalism with the imperatives of modern entertainment (namely, creating an experience of play in an immersive environment). With respect to the social life of scriptures, one of the most exciting potentials of this project is to ask how the entanglement of religion and entertainment is dialectically fused with the act of materializing scripture. How does each component introduce constraints and possibilities? View from the Ark Encounter Observation Deck, which opened in summer 2015. Visitors view the ark under construction. 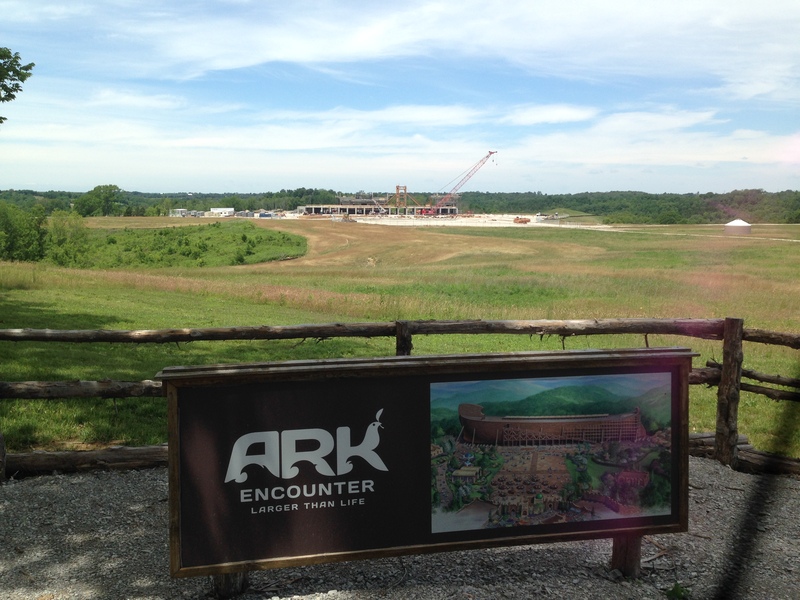 The distinctiveness of Ark Encounter as a project rests in both of these matters – religion and entertainment, materializing scripture. However, I think it is an open question as to how all of this is “particularly American.” This is a very common reaction to the details of Ark Encounter, and was part of my early thinking as well. But, when you look globally, which is what we are trying to do with the “Materializing the Bible” website, you see similar sites throughout the world. In some cases it is certainly true that American actors, finances, and structures are part of creating and maintaining sites. But, this is not universally the case. We also cannot simply chalk other projects up to chasing an American model. Ultimately, I think it will be more productive to ask what global flows and imperatives are being localized by both American and non-American actors in ways that converge and diverge. Q. Yes, a chance to step into the semiotics factory and see how the proverbial sausage is made, what an opportunity! I think your calling it a “theoretical conceit” is modest—even if strictly speaking, honest. Rather than a conceit, I would contend it is a necessary theoretical approach, urgent even. I was particularly struck by your description of the production team’s imagined interlocutors, the ideated antagonists who help shape the exhibits. After all, there is the entertainment value imperative to the final production, a “fun-filled family-friendly” encounter with the Ark, but there is also the entertainment, the play, of the production itself. The production team is itself acting on a righteous mission, is playing at saving. Entertainment and religion are already in the mix in the making—not simply in the made. 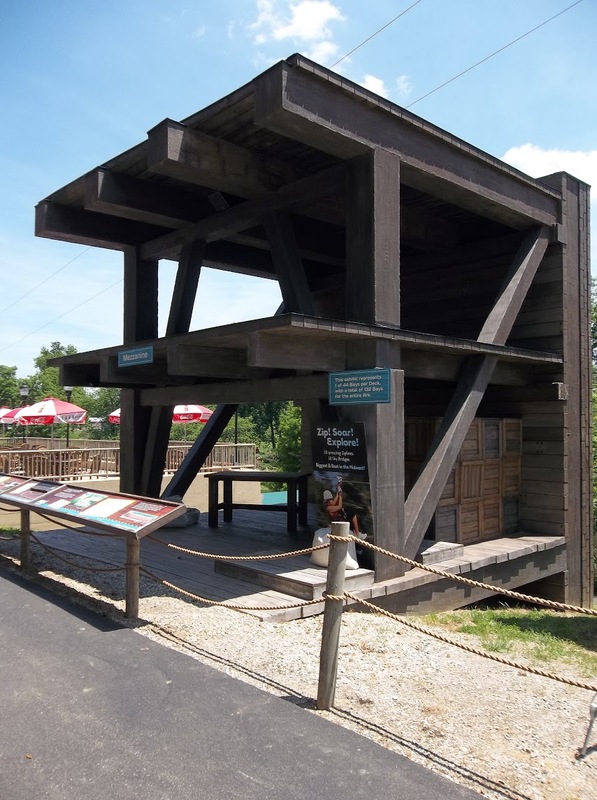 We can come back to the “Americanness” of the Ark Encounter a bit later, but for now, I was hoping you could speak a bit about the ways in which entertainment and religion are “dialectically fused” in this theme park’s materialization of scripture. A. How are entertainment and religion “dialectically fused” in the park’s materialization of scripture? One of the primary examples is the team’s model of conversion. An important dynamic in studies of religious conversion are the strategies actors use to engage potential converts. Two case studies I have found useful to think with in this regard are Ann Pelligrini’s article on American evangelical hell houses (American Quarterly, 2007) and Graham Jones’ article on evangelical magicians (Cultural Anthropology, 2012). Both of these cases illustrate how particular tactics are marshaled and performed to set the conditions for conversion to happen (respectively, fear and illusion). For the Ark Encounter creative team, conversion is grounded in play. Their wager is this: visitors to the park will be immersed in the creationist version of biblical history. Visitors will get caught up in the experience of Noah and his family. Engaging with the materialized Bible is the basis for conversion. So, successful creativity and design, successful production of the park, will produce converts: from non-Christians to Christianity and non-creationists to creationism. Here, I have found Peter Stromberg’s work on the modern culture of entertainment, in particular our affinity to play in immersive environments, particularly useful. Once we look closely at the team’s creative practices, examples proliferate in terms of how they go about re-creating the world of Noah in a way that, they believe, will immerse visitors and set the conditions for conversion. One of my favorite examples is a map of Eden one of the artists created. This map has featured prominently in fundraising materials and will eventually feature prominently at the park. Creating a map of Eden is not a novel act among creationists. What is novel is the register the map works in. Other maps work in a realist register, one that uses indices like latitude and longitude, references to bodies of water and modern nation-state borders (see Brook Wilensky-Lanford’s Paradise Lust (2011) for examples). The team’s map, however, works in a fantasy register. On first glance, it reminds one of Tolkien’s map of Middle Earth. This is no coincidence, as the artists who designed the map kept a printed and matted version of Tolkien’s map in his office cubicle while he worked. So, here, fantasy is used as a resource to materialize the literalist Bible. Q. Stromberg’s work is interesting in this context. On your recommendation I spent a little time with Caught in Play: How Entertainment Works on You (2009) before we began our discussion. His emphasis on play rather than ritual as it relates to entertainment was refreshing—even if, for me, a little too rigid in its phenomenology. His insistence, for example, that we divide ritual from play based on the “earnestness” with which one engages in the former over the latter, feels a bit too narrow. He’s incredulous that anyone would “find answers to life’s greatest questions in entertainment.” One wonders what he would make of Charles Dickens, or Shakespeare, or the performances of George Whitefield, as described by Harry Stout (The Divine Dramatist, 1991). Stromberg, to his credit, says as much in his notes, acknowledging that the distinction between ritual and play may be “an artifact of Western history,” but in that lacuna I see a tremendous opportunity. An opportunity that your work capitalizes on. It seems to me, and I’m hoping you can help unpack this, that one of the things your work on materializing scripture reveals is the permeability of, what are commonly understood to be, distinct cultural formations. There is in practice an exchange of strategies and “tactics” between these (apparently) disparate groups. The tolkienized map (if I can be permitted to turn Tolkien into an adjective), for example, is a wonderful example of this, of demonstrating how “religion” is not this thing out there, separate from the hurly-burly of “materialist(ic)” culture–“polluted” by it as it were. Rather, there are tactics deployed by all large scale social formations to coalesce group identity, to bolster group membership, tactics that are, as Stromberg points out, endemic to contemporary media culture. Can you speak about some of these tactics as it relates to your work? A. You are right on point in observing the permeability among religion and other cultural formations. This project certainly works with this as a starting premise. Of course, this is not a novel approach. In religious studies, all the work on lived religion has stressed this for at least a couple of decades. And, in anthropology there is the foundational principle of holism (that cultures work as interconnected wholes, not as a collection of discrete spheres). Still, when it comes to religion and certain formations (for example, entertainment and capitalism) there is a lingering stubbornness. When scholars are resistant to seeing how religion is deeply entangled with modern entertainment or market-based capitalism, that is pure ideology. What it reveals are the normative assumptions people have about what is “real” or “pure” religion and what is “polluted” or “corrupted.” In fact, as you observe with Stout’s The Divine Dramatist (and, I would add Laurence Moore’s Selling God), there are longstanding entanglements that religious actors have worked with very intentionally (and, by various measures, very successfully). Of course, that’s not to say that religious borrowings from the worlds of entertainment or market-based capitalism experience no tensions or disruptions. They do. But, this is not proof of incongruence, it’s an analytical opportunity. It is exciting to explore how and why the tensions arise and what people do in response. This was something I saw with the creative team. While they were sold on the promises of immersive entertainment, they always kept a watchful eye on the potential for those promises to clash with their religious imperatives. For example, they constantly asked whether the immersive environments they created were becoming too imaginative vis-a-vis their literalist approach to biblical texts. Model of Ark Encounter exhibit bay, built outside the Creation Museum. The completed ark will include 132 bays, 44 per deck. When it comes to the entanglement of religion and entertainment, I do see this project as making a distinctive contribution. Again, this is an approach that Stromberg’s work really helped me pin down (also, as you will see in a moment, Bourdieu). When scholars write about religion and entertainment, they do so with the sense that these are distinct social spheres that intersect, overlap, borrow, or otherwise come together. This is not an altogether flawed way to conceptualize what is going on. But, I want to go a step further (or, perhaps, a step to the side). What if we conceptualize entertainment as instilling in us, as late modern subjects, certain dispositions? Then, religious actors work with those dispositions (quite self-consciously in the case of the creative team, and perhaps less so with visitors’ devotional consumption) as they experience religious life. For example, there is the disposition to favor and to find pleasure in immersive entertainment. This disposition is now playing a central role in the production and consumption of a biblical theme park. Were we to shift the focus from entertainment to consumer capitalism then we would have another set of dispositions to consider, which are better understood at the moment (e.g., the recent volume Religion and the Marketplace in the United States). This engages more seriously in how deeply we are all shaped by modern entertainment and how deep the entanglement with religion can go, rather than simply observing religion and entertainment as social spheres that exist in some kind of relationship. And, to your question, the tactics and strategies we observe (in both production and consumption) can be traced to the instilled dispositions. Q. Your premise may not be “novel,” it’s true, but to call the resistance to this kind of work a “lingering stubbornness” in the field seems generous in its understatement. You’re very diplomatic in your assessments. I think “pure ideology” is spot on, however. After all, we’ve known at least since Weber and Durkheim that religion, or institutionalized otherworldliness, isn’t so easily disentangled from its more mundane relations. Bellah reminded us again in 1967, with his essay “Civil Religion in America,” even remarking in a footnote on the oddity that his should be the first essay to theorize the religious character of the “American way of life,” (to borrow Will Herberg’s phrasing). Mary Douglas described this “stubbornness” as a sort of structural amnesia in How Institutions Think (1986)—though she was not writing about religious scholarship in particular. At times, to me at least, it feels less like a lingering remainder within the field and more like the persistent raison d’etre of the field. However, that argument will take us too far a field, I think, but I don’t think it can be overemphasized that it is always the background noise against which more novel projects like yours must compete. Feel free to respond, of course, but I’d prefer to pivot to Bourdieu as it relates to our earlier discussion of the “Americanness” of the project. Previously you said (and I’m paraphrasing) that your explorations of the habitus of contemporary immersive entertainment culture—vis-à-vis the Ark Encounter, and the Materializing the Bible project more broadly—has led you to revise your earlier thinking about the Americanness of the Ark Encounter. Can you say a little bit more about that? In particular, I’m thinking about Vincent Wimbush’s most recent book White Men’s Magic (2012), and his use of the structuralist Yuri Lottman to help him think about the role of scripture in the formation of whiteness in Hanoverian England. As you know, he calls the intersecting network of signs and statuses that describe a social formation a semiosphere. Would it be right to think of these various materializations of the bible as a kind of global semiosphere, one that is generally Western, but particularly American? One in which the actual nationality of the actors is less germane to the cultural production than the significations themselves—a kind of politics of entertainment. In other words, do you feel that the modern subject’s disposition towards immersive entertainment is political or coincident? That being said, cultural inspirations like Disney and Hollywood are pivotal for thinking about strategy; that is, how re-creations are approached and performed. The virtual problem can be actualized in widely diverse ways, and it is no accident that immersive entertainment has become a dominant strategy. In this case, the designation of Americanness becomes applicable again. So from this angle, yes, I think Wimbush’s semiosphere would be a useful way to characterize the various contemporary cultural productions that fit under the rubric ‘materializing the Bible.’ To your closing question – ‘do you feel that the modern subject’s disposition towards immersive entertainment is political or coincident?’ – it is certainly not coincident and I would agree that it is politicized (or, politically charged). Perhaps this helps highlight an important distinction between immersion and immersive entertainment. The trans-cultural and deeply historical pattern that indexes re-creations as a response to the virtual problem of authenticity are about immersion. But, they should be differentiated from modern productions like Ark Encounter, which also reproduce the imperatives of immersive entertainment. Ark Encounter and its kin are no less responses to the virtual problem, but they add to this the American semiosphere of religion-entertainment. Q. It’s funny that you mention The Sacred Mount of Varallo. One of the first things that came to mind when we began our conversation was the seemingly universal tendency of “world religions” to (re)imagine the mythology of their geneses spatially—the artificial habitat of the habitus, if you will. The example that occurred to me at the time was Angkor Wat, with its famous spires modeled after Hinduism’s sacred Mount Meru. It’s an altogether strange and fascinating thing that Cambodia in the 12th century, at the height of the Khmer empire’s power, was describing its political potency in the mytho-poetics of Sanskrit. Sheldon Pollock famously calls the linguistic and cultural dominance of South Asia during this time period sanskritization (The Language of the Gods in the World of Men, 2006). Concerns about pollution and authenticity abounded, as they also apparently do for the project designers of the Ark Encounter. It’s “the problem of authenticity,” as you said, or “keepin’ it real,” as the vernacular goes. Certainly it’s a concern in Kentucky, but it was also, as you pointed out, a concern in Loreto, Italy, as well. I wonder if that anxiety isn’t lurking in the hearts of all supra-spatiotemporal pieties? The feeling that we are “always-already” too late—to borrow Merleau-Ponty’s phrasing. It is a question for another day, I suppose—unless you have an answer ready at hand, that is? I should add, however, that your distinction between “immersion” (a temple like Angkor Wat, for example), and “immersive entertainment” (Ark Encounter) is very helpful in drawing a tighter circle, and thus bringing the contemporary situation into greater focus. We’ve moved quite a long way from your foundational interests in the Materializing the Bible project, so I’d like to give you a chance to circle back around to any topics we passed over too quickly—or not at all. I’ve very much enjoyed our exchange, and have learned much from it. Thank you very much for your time and thoughtfulness. The floor is yours. A. Thank you for pointing me to Angkor Wat; I had never seen this site and it’s a wonderful illustration of immersion via re-creation without leaning into immersive entertainment (at least viewing the site virtually, perhaps the tourist industrial complex has begun to incorporate those elements at the attraction?). The broader move of treating this as a comparative problem across religious traditions is also quite helpful. To point to two other examples that do lean to immersive entertainment, there is Suoi Tien in Ho Chi Minh City (Vietnam) and Haw Par Villa (Singapore). Suoi Tien is a Buddhist water slide park that opened in 1995. Here, “employees dressed as golden monkeys scamper around the grounds,” which are full of “huge sculpted dragons, tortoises, phoenixes and Buddhas.” And, Haw Par Villa depicts “the 10 courts of hell [in] Chinese folk tales, myths and Confucian beliefs.” Other examples abound, I’m sure. So, is there an impulse to spatially (re)imagine genesis mythologies lurking in the hearts of all supra-spatiotemporal pieties? Arguable, yes. And, arguably, a tacit or overt recognition of this lurks as part of the entire media turn in the study of religion. This comparative angle is promising for me as I think about what about Ark Encounter (and materializing the Bible more generally) is particularly Christian in nature and what is more common to the material nature of religious life. Returning to Bialecki, how much traces to particularly Christian virtual problems and what traces to the virtuality of religion? The comparative angle is also helpful for thinking through empirical questions. What strategies are mobilized in acts of cultural production (scripture, religious tradition and ritual, Disney, Hollywood, etc.)? What strategies do consumers marshal as they visit and experience sites?